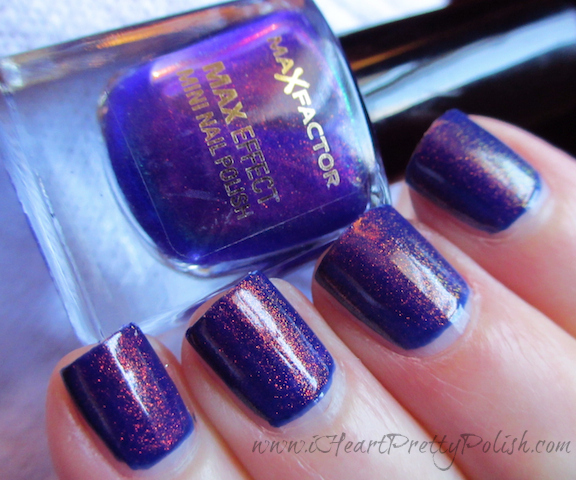 I am excited to show you the beautiful Max Factor Fantasy Fire. I decided to layer this over a deep blue - Ulta Moody Blues. 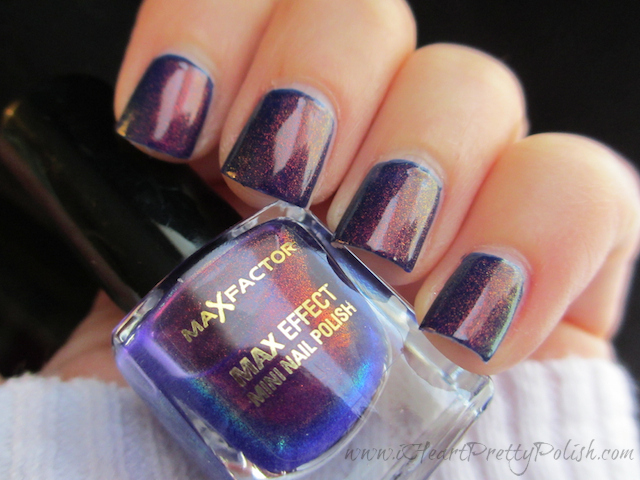 Max Factor has a blue/purple jelly base with red color shifting shimmer. The color shifts consists of red, orange, green, and yellow - depending on the light. For these swatches, there are 2 coats of Fantasy Fire over 2 coats of Moody Blues. I actually liked it a bit more with just one coat of Fantasy Fire - but this is really pretty too. I'm excited to wear this over other colors and as my friend Liesl suggests, all by itself! Here are her swatches of Fantasy Fire on it's own....so beautiful! I love the fact that this polish can be so versatile. For those of you who don't already know (most polish addicts do) Fantasy Fire is only available in the U.K. It's a drugstore brand, so it's kindof funny that we, in the US, get sooo excited about it. There are a few ways to get your hands on this polish. 4. Take a trip and find it yourself! You will be seeing this polish on my blog a bunch more as I play around with the different bases. Thanks again Liesl! Have a great day everyone. Aw :) My heart's all warm right now :) Thanks for the shout-out :) Your photos are gorgeous, as usual. I knew you'd capture this one beautifully. I have this one stuffed away and I think I may need to bust it out soon. I love your layering combo! 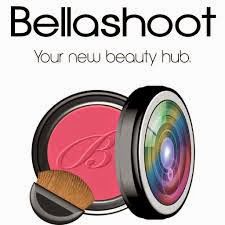 It looks stunning on you! Yes, you need to. That poor little guy wants out! Oooo girl I am so totally jelly! This is a stunner and it looks amazing on you! I love how it looks over Moody Blues! No, I can't believe it. I wanted to wear it the day I got it but I had to wear my black and red nails. So the next opportunity I had to put it on, I did. I love it and can't wait to play with it more over other colors. This is absolutely STUNNING. Oh man I would love to own this! This is very pretty. I love purple. yes, it's not overrated, that's for sure. Ahhh you are among the chosen ones ;-)!!! How beautiful on you and I look forward to seeing all its appearances. I've heard of both of them and would love to visit one some day! It's so beautiful, I love it - I was lucky to get one for my birthday! I just got this in a swap not too long ago, and totally agree with you, it's sooooo beautiful!! !